What differentiates a DEXA scan from any other body composition test is the amount of specific and thorough data that is produced from a standard report. Whether you’ve had multiple scans or are anticipating scheduling your first appointment, it is helpful to understand how to navigate your results to get to know your unique body composition. Interpreting DEXA scan results may not be intuitive to most, but with a bit of acclimation, it becomes second-nature. After completing a DEXA scan, a large amount information is collected that dives deep into body composition measurement and analysis. Data are portrayed through simple tables, graphs and images representing your body composition and how it has changed over time. Interpreting and understanding your scan results will make you get the most of your visit and help inform a plan to reach your goals with the help of a trainer and nutrition coach. DEXA results include five general buckets of information related to lean mass (all tissues in the body except bone and fat), fat mass, bone density and visceral fat. Your DEXA technician will guide you through each piece of your results packet, but for a refresher, follow along below to become more familiar with your results. 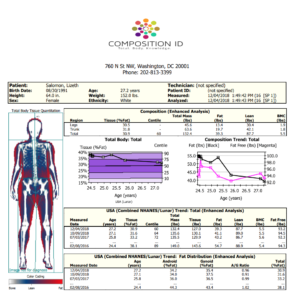 The first page of scan results is a basic overview and general analysis of body composition. 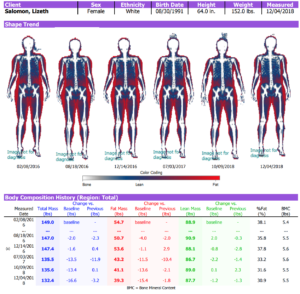 The most prominent feature on this page is the visual representation of the body, with color-coded regions representing lean mass (blue), body fat (red) and bone mass (white). To the right of the image is a numerical breakdown of the percent of each type of tissue found in the body, separated by legs and trunk region (Composition: Enhanced Analysis). Directly underneath lies two graphs that show trends over time, in particular, how percent body fat has changed over time (Totally Body: Total) and how body fat mass compares to lean mass trends over time (Composition Trend: Total). The two additional tables outline a summary of data from previous scans compared to the current scan. The most significant piece of information to notice is the fat, lean, BMC and fat-free mass data on the USA Trend: Total table. These numbers are a first glimpse into the breakdown of your body composition numerically. Another important measure provided in the USA Trend: Fat Distribution table is android and gynoid percentages and ratios. Android: the android region represents the midsection of the body (waist). A high measure of body fat in this region may indicate a higher risk for cardiovascular disease, as belly fat is physiologically different than subcutaneous fat. Gynoid: the gynoid region is the hip portion of the body that tends to accumulate more subcutaneous fat, particularly in women. A/G Ratio: The fourth column in the USA Trend: Fat Distribution chart indicates a ratio of Android to Gynoid fat percentage. It is recommended to maintain a ratio of under 1 (meaning it is typically a better measure of health if the Android region remains a lower relative percentage than the Gynoid region (commonly known as the hip-to-waist ratio). In the next section of your scan results, you’ll notice color-coded images of your body composition over time, with corresponding data included in the table below. This table introduces the concept of numerical changes in data over time, noted in the columns labeled “Previous.” A negative value under this column signifies a reduction in a measurement (body fat or lean mass) from the previous scan. Likewise, a positive value means an increase in a measurement of body composition. Three graphical representations of this data are included beneath the Body Composition History chart which break down trends in total mass, body fat and lean pounds by months and years. This portion of results contributes to one of the many characteristics of a DEXA scan that differentiates this technology with other types of body composition tests. 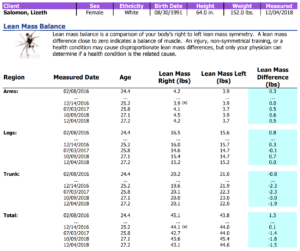 Here, you’ll find a regional breakdown of lean mass (page 1), percent body fat (page 2), and a color-coded graph that displays body mass trends over time. As you follow the first chart, you’ll see lean mass in pounds for each region of the body – arms, legs, and trunk (neck to hips) – collected from your most recent scans. Similar to the Shape Trend analysis, the chart includes mass differences in pounds represented by positive and negative numbers as indication for body mass changes regionally over time. 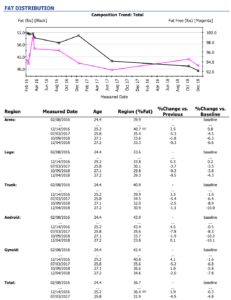 The second page of this report gives an in-depth look at percent body fat regionally, including android (waist) and gynoid (hip) regions, and comparisons from previous and baseline scan data. Another differentiating aspect of a DEXA scan is its ability to assess bone mineral content. Since DXA technology uses X-ray beams to measure body composition, it’s easy to see how this could be an important inclusion in DEXA scan results. 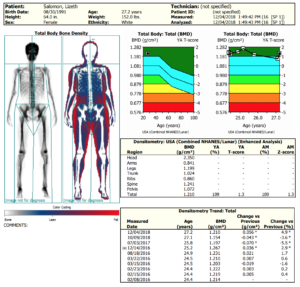 The Total Body: Bone Density report provides a general image of the skeleton, as well as two colorful graphs that indicate where among the range of T-scores your bone density measurement lies compared to NHANES data. The important ranges to note in these graphs are the blue sections (between -1 and +1) which give an estimate of a healthy range of bone density. If your measurement lies far below this zone, it may indicate a higher risk for osteoporosis. 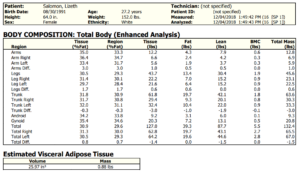 The last pieces of information produced from a full DEXA report is a comprehensive breakdown of body fat, lean tissue, and bone density of each region of the body, displayed in percentages and mass in pounds, and an estimate of visceral adipose (fat) tissue. The first table on this page essentially serves as a numeric overview of the previous sections of information for quick reference. The second table on this page provides an estimate of visceral adipose tissue, which is the fat surrounding the internal organs of the body, which if high, can signify a higher risk of certain conditions, such as cardiovascular disease, diabetes, and obesity. It’s particularly important for this number to remain lower than 1.0 lbs in mass. Lifestyle modification (eating nutrition, whole foods, and exercising regularly) can help to lower this measurement. Fully understanding DEXA scan results is important as you continue to gauge progress towards your goals. If you still have questions or would like to schedule an appointment with one of our experts, contact a Composition ID team near you! Learn more about DEXA technology here.